Excessive screen time poses a legitimate threat to a child’s visual health, school performance, and overall behavior. That’s why figuring out how to limit screen time is so important. Check out our 39 tips to make it happen as we promote Screen-Free Week 2018. Screen-Free Week is a nationwide event that runs April 30 - May 6, 2018. We’re encouraging children and adults to limit screen time and take a break from TVs, smartphones and tablets. 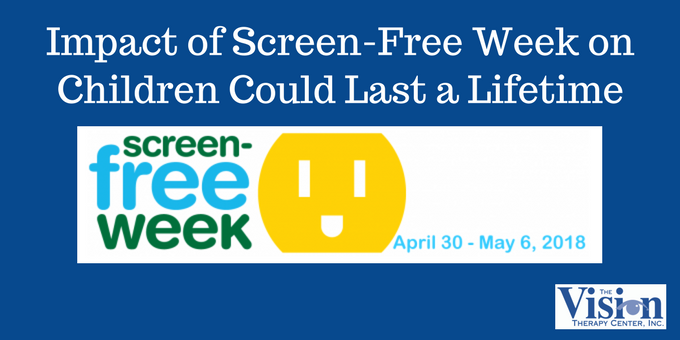 Screen-Free Week was originally “TV Turnoff Week,” and was organized by the Campaign for Commercial-Free Childhood in 1995. 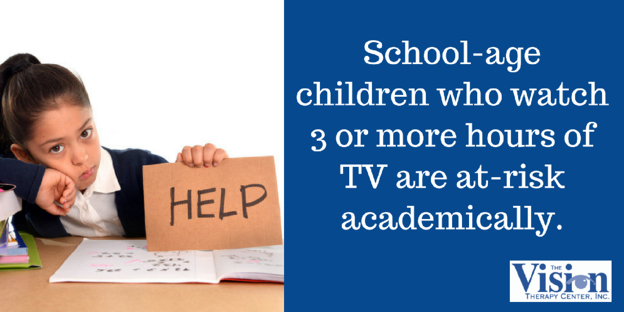 As research has proven throughout the years, too much TV can have a profound impact on learning and behavior. It’s why organizations like the American Academy of Pediatrics, American Medical Association, the National Education Association, and Big Brothers/Big Sisters have supported TV Turnoff Week. And while much of the original intent of TV Turnoff Week was to limit a child’s exposure to commercials, the issue of screen time has become the real health threat. Screenfree.org put together a well-researched document that illustrates the impact screen time has on young children and older children. The statistics we’re citing in this post are all sourced in this document. These statistics aren’t encouraging. 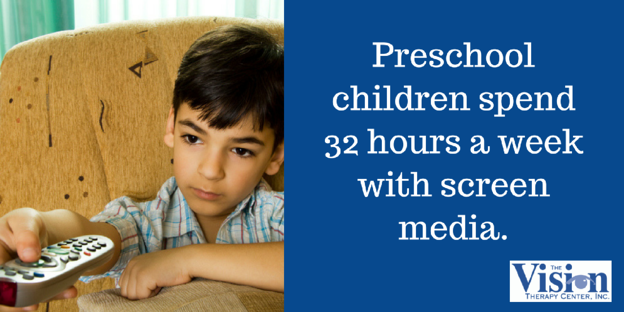 On average, preschool children spend 32 hours a week with screen media. Forty percent of 3-month-old infants are regular viewers of screen media, and 19% of babies 1 year and under have a TV in their bedroom. What’s the fallout from that amount of screen time? Screen time for children under 3 is linked to irregular sleep patterns and delayed language acquisition. The more time preschool children and babies spend with screens, the less time they spend interacting with their parents. Even when parents coview, they spend less time talking to their children than when they’re engaged in other activities. Toddler screen time is also associated with problems in later childhood, including lower math and school achievement, reduced physical activity, victimization by classmates, and increased BMI. Direct exposure to TV and overall household viewing are associated with increased early childhood aggression. The more time preschool children spend with screens, the less time they spend engaged in creative play – the foundation of learning,constructive problem solving, and creativity. Screen time can be habit-forming: the more time children engage with screens, the harder time they have turning them off as older children. The numbers don’t get any better as children get older and start using electronic devices even more. Including multitasking, children ages 8-18 spend an average of 4 ½ hours per day watching television, 1 ½ hours using computers, and more than an hour playing video games. 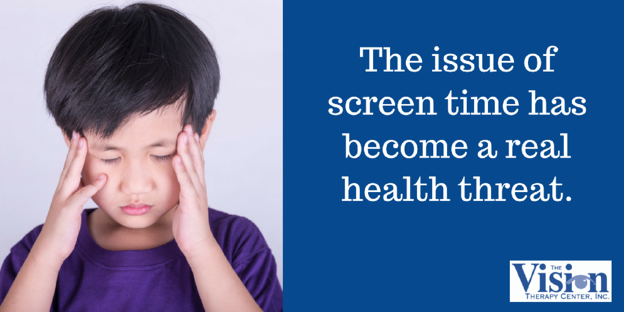 Time spent with screens is associated with childhood obesity, sleep disturbances and attention span issues. Children with 2 or more hours of daily screen time are more likely to have increased psychological difficulties, including hyperactivity, emotional and conduct problems, as well as difficulties with peers. Adolescents who watch 3 or more hours of television daily are at especially high risk for poor homework completion, negative attitudes toward school, poor grades, and long-term academic failure. Adolescents with a television in their bedroom spend more time watching TV and report less physical activity, less healthy dietary habits, worse school performance, and fewer family meals. Children with a television in their bedroom are more likely to be overweight. Especially high rates of bedroom televisions (70-74%) have been seen among racial/ethnic minority children aged 2 to 13 years. 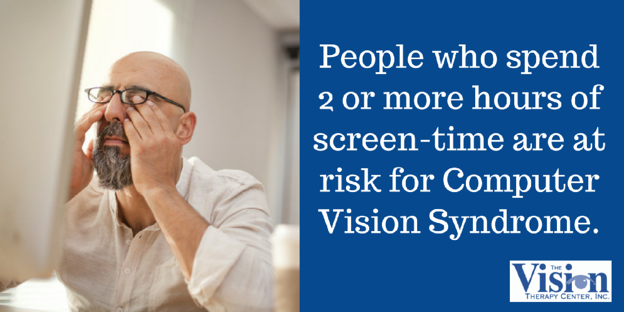 Computer Vision Syndrome can impact your functional vision system, which is why we provide these guidelines for proper usage of computers and smartphones in respect to your visual system. Ok - I’m In! Now What? We’ve provided you with solid research on the dangers of excessive screen time for kids. You realize the threat, and you’re ready to take action. But what in the world will you and your children do for an entire week? And more importantly, how can you keep it going after the week is over? Here are some ideas for what your organization can do to participate in Screen-Free Week, as well as on a personal level. Ok, we understand quitting cold turkey is going to be very hard for a lot of people. But here are some ways to get the ball rolling and limit your screen time for the week. Call a relative - those phones can be used to talk, too! Put on a play - get the neighborhood kids together and write a play! 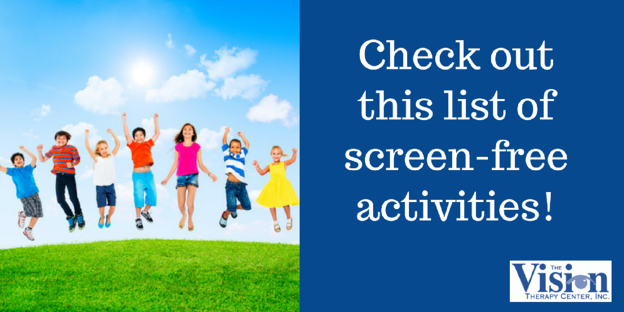 A huge list of screen-free activities! This year, The Vision Therapy Center is encouraging our patients and staff to take the “Screen-Free for a Week” pledge. We are gathering names at our front desk, and providing handouts to everyone on alternative activities. Schools and libraries are also getting in on the fun in a big way. Here are some great examples of what’s happening across the nation. We love all these ideas for the week. But how do you keep this going when the seven days are done? Here are a couple of suggestions for kids and adults, too! One of our favorite tactics is to “negotiate” (and we use that term loosely for parents) a balance. For every hour playing video games, they must spend an hour either outside, reading, or pursuing one of the other 40 items we’ve listed above. You can structure non-screen time just as easily as you can a kid’s sporting event or other extracurricular activity. Besides setting some of the ground rules for screen time limits, make sure they have plenty of alternatives on hand. Screen time is really a lot of unproductive time. Some top bloggers shared some ideas on how to turn that around. Look, we know this won’t be easy. Many of us at The Vision Therapy Center have children of our own. We know how much screen time is enmeshed in our cultural fiber. But here is perhaps the biggest compelling reason you should do this. Your kids don’t know any other way. The generation of children now growing up have been raised in a world of multiple screens and electronic devices. It has become so ubiquitous that many of them simply can’t imagine a world without screens. And that’s sad. Because they might not know the joy of a long, screen-free walk in the woods. Or the thrill of becoming immersed in a book. Or what kind of worlds they can create when they let their imagination run wild. Your kids will thank you when the week is done. In fact, they just might find that a screen-free world isn’t so bad after all!